External hard disks are a convenient form of portable data storage medium with which you can carry files and media and use it anywhere you want without an internet connection. Due to the constant evolution of data storage technology, the size of these hard disks now match or exceed those traditional hard disks and feature much more advanced capabilities. In this article, we bring you the best six 1TB external hard disks available in the Indian market. Ranging from wired to wireless storage form factors, we hope this article will guide you the right way to a rewarding purchase experience. 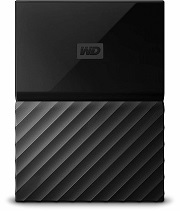 Western Digital is an American Data Storage company that has been the pioneers of portable storage mediums since time immemorial. My Passport series from Western Digital was one of the first entrants to the Indian external hard disk market and been one of the people’s favorite since then. There is no necessity for an external hard disk to look good. But in the case of WD My passport hard disks, the company has done some serious homework on its design and the result is evident. The two-tone texture of the chassis would really turn some heads on the first glimpse of this product for sure. The upper half is a normal non-textured plastic casing and the lower half has this attractive lines that add looks as well as a comfortable grip to the product in hand. Not only that, this external hard disk from WD comes in a variety of different exciting colours such as dark blue, red and black which will make it a fashion statement along with the means of portable data storage. This portable hard disk comes with a 1TB storage capacity. In our opinion, if you are an average person, 1TB worth of space will be more than enough for your immediate use such as storing photos, occasional movies and TV series and even some documents as well. Mind you, we’re not judging you in any way, but we genuinely feel for a price around Rs.3,700, 1TB storage space is actually decent. That too with a host of other features that the company provides with this product, this is definitely a product worth having your attention. This hard disk has a USB3.0 interface that will fasten up your data transfers across devices supporting the same. It does work with USB2.0 devices as well, albeit with slow speeds. Western Digital has a host of software utilities to enhance the usability of their products. One such software that comes with this external hard disk is the WD backup. This piece of software will allow you to make backups of local files on your computer such as photos, videos and documents to this external hard disk at the click of a button. The process is simple and straightforward and saves you a lot of time in searching for a backup tool on your own. Unlike other hard disk manufacturers, WD emphasis a lot of security. This WD My passport comes with a 256-bit AES hardware encryption that is very tough to break in to and will keep your files and folders safe. This product comes with a three-year limited warranty that will cover unforeseen issues with the device such as any hardware failure resulting in its own and not due to user actions. WD My Passport is a stylish and sleek little external hard disk that performs well in terms of data storage and retrieval. The read/write speeds are consistent and will give you a pleasant experience over the course of time. The hardware encryption feature and WD backup software will make you feel comfortable knowing that the security of the data stored inside is of high priority. Seagate is an US-based data storage company popular for its consumer-level storage products in the Indian market. The Seagate Plus Slim is one of the most popular budget 1TB wired external hard disks that have been in the market for quite a while. The Seagate Plus Slim as the name suggests sports an ultra-slim 12.1mm thick chassis made from high-quality plastic material. Apart from the Seagate logo and the neatly laid out status LED on the front, there aren’t any sort add-ons on the exterior of this budget external hard disk. This hard disk is very pocketable and weighs only about 160g. The supplied micro USB to USB 3.0 cable is 46cm in length which is more than enough in most of the use-case scenarios. This 1TB portable hard disk is intended for those who are looking for a supplementary storage device for use alongside their laptop or smartphone. Phones and laptops these days come with sufficient internal storage and most of the users won’t even utilize that in full. If you’re an average user, this hard disk can store all your documents and media files and still have some extra free space. This portable hard disk is compatible with both USB 2.0 and USB 3.0 devices. The only difference is that the copying speed will be slower in the former than the latter, which is to be expected. The Lyve app from Seagate helps you backup the contents of this drive into the cloud and access them anywhere, no matter the device – be it your laptop, smartphone or even your tablet. The Seagate Plus Slim is a budget 1TB hard disk which provides a convenient and portable data storage medium for budget conscious Indian consumers. Sony HD B1 is a portable hard disk with 1TB of storage space with support for the latest USB3.1 technology. This hard disk has a wide compatibility with different operating systems and doesn’t slow down from system to system according to the operating system it is based upon. The outer chassis of this portable hard disk is made of plastic and surprisingly, not something of the quality we expected from Sony. The bright colour scheme masks the lack of quality of the plastics but it is easily prone to scratches and dents and may even break if fell on a surface face down. The Sony logo is embossed on the on the otherwise bland shell. The ports and connectors are located on the top and bottom sides of this hard disk. The Sony HD B1 has a 1TB storage capacity with superspeed USB3.1 technology powering the data transfer. With compatible USB3.1 hosts, this device will deliver read and write speeds around 125MB/s. This value further decreases to around 80MB/s with USB3.0 ports and further to 40-50MB/s when used with USB2.0. The transfer speed remains almost constant during the process, indicating excellent HDD health and optimization. The Sony HD B1 uses NTFS protocol for data storage, NTFS has several advantages over the FAT32 protocol such as faster access speeds and easy file recoverability. Sony provides extensive software support for this portable HDD such as data transfer accelerator and password protection manager. Encrypted with 256-bit AES security, your data inside this external hard disk will remain safe even if anyone tries to brute force the access drive without a valid password. If you are in search of a budget portable hard disk capable of high-speed data transfers, the Sony HD B1 is an excellent choice. With the latest USB3.1 support and wider compatibility, this hard disk is capable of delivering your data storage needs with much-improved read and write speeds. ADATA is a Taiwanese memory and storage manufacturer which is popular for budget USB drives and such in the Indian market. The HD720 from ADATA is an external portable rugged and all weather use the hard disk with a 1TB capacity. ADATA HD720 sports a rugged silicone material outer casing which offers military-grade shock resistance and waterproof features to this external hard disk. This portable hard disk from ADATA has undergone several drop tests during its testing and design phase. Even with that level of extensive abuse, this product continued to perform the same as it was before which itself is a testimony to its build quality and durability. This external hard disk features a wrap-around cable that is easy to plug into the host device. Since it remains attached to the hard disk, the fear of losing or forgetting the cable back at home is not an issue anymore. This external 1TB hard disk from ADATA comes with an IP68 certification. It can stay submerged under 2m of water up to 60 minutes and still function as normal. This is something remarkable. Isn’t it? If you are a travel junkie and would like to backup your photos and other data on the hard disk instantly so that you can free up space on the SD card, this hard disk might be the best. With such an excellent all-weather usage capability, nothing will stop this device from safely storing your data. With the latest USB 3.0 interface, this portable hard disk can transfer content much faster than the USB2.0 counterparts. In terms of compatibility with older devices sporting USB2.0 ports, it works perfectly without any issues. One of the USP of this hard disk is that it has a shock sensor inside. If the drive detects a fall, it stops the operation of the flash memory inside to safeguard and keep the data inside intact. The ADATA HD720 is the best rugged and all-weather use, a portable hard disk in the market at present. Period. If you are a travel junkie who likes to travel a lot, the ADATA HD720 would be the best companion to keep your memories intact even in scorching heat to sizzling rains. Ever dreamt of streaming data wirelessly to the external hard disk and back? Well, the dream has come true with the Passport Wireless Pro from Western Digital. The My Passport Wireless Pro is a 1TB Wi-Fi-enabled portable hard disk that can double up as a media server and a portable power bank as well. Boxy Design That Looks Ordinary. The design of this futuristic portable hard disk is OK, to say the least. The boxy design, we think emphasizes the practicality aspect rather than the eye-pleasing design. On the front, there is a row of four blue LED indicators that notifies about the charge left in the device. Below that there are two LEDs indicating the connection status of the device as well. The power button is located on the top. The button is quite big and responsive. This portable wireless hard disk has a USB3.0 port and a regular USB2,0 port to connect with devices over the wire without making use of Wi-Fi. There is an SD card reader on this device as well. This portable 1TB hard disk has built-in Wi-Fi that will let you connect to this device wirelessly and stream content from it. You can connect up to 8 devices simultaneously and stream content without any sort of lags or stutters happening in between. The wireless 802.11 ac Wi-Fi lets you transfer content from other Wi-Fi enabled devices such as cameras, smartphones or laptops quickly. Using media software such as Plex, this device can be used as a portable media server at home where you can upload movies and watch them on your devices over the air. The WD Passport Wireless Pro has a 6400mAh battery pack inside. This will let this portable hard disk to last for about 10 hours of continuous usage. What more special about this hard disk is that with the built-in USB2.0 port, you can double it up as a power bank and charge your smartphones and other devices as well. With WD’s My Cloud App, this portable 1TB hard disk can be hooked up to a network at home or office and the files inside can be accessed from any part of the world seamlessly without any interruption. If you want an all in one device with the properties of a portable hard disk, the WD Passport Wireless Pro is a great start. Wireless operation enables movie/photo streaming over the network to simultaneous devices at once and thus being a perfect media server device at home. The power bank option is also an added bonus which will let you stay powered even when you are away from the grid and your smartphone is about to die. Toshiba Canvio lineup has some excellent storage devices in offer ranging from traditional hard disks to internal SSD. The Canvio Basic is an entry-level portable hard disk with 1TB of storage capacity priced competitively under a budget of Rs.5000. The Toshiba Canvio Basic has a hard plastic outer casing with a mesh design which makes it look kind of a premium device. The edges of this external hard disk are bevelled and there are no sharp corners that would pose an uneasiness while holding it in hand. There is a status LED on the top part indicating the mode of operation. This LED will automatically turn off when not in active use. The Toshiba Canvio Basic comes with a 1TB storage out of which nearly 930GB is available for users to save and store their files. This external hard disk follows USB3.0 standard for high-speed data transfer between the source and host devices such as laptops and smartphones. This device is backwards compatible with the legacy USB2.0 ports albeit having significant speed drops when compared with a USB 3.0 port. This portable hard disk delivers about 30-40MB/s of read and write speeds when used with USB2.0 ports and up to 100MB/s read and write speeds when used with high speed USB3.0 ports. The Toshiba Canvio Basic is a plug and play device that doesn’t require any drivers to install for you to use this hard disk. When plugged into the laptop or any other device, it automatically detects the device and mounts as a storage device. The 5400rpm motor inside is relatively silent and works well even while using it in transit, for eg: while inside a vehicle on a bumpy road. The Toshiba Canvio Basic is a no-frills portable 1TB hard disk supporting USB3.0 protocol for high-speed data transfers. Being a plug n play device, this device can be used right out of the box and with 3-years warranty available, there is nothing much to worry. The list for the best six 1TB portable hard disks marks its end here. If you have any suggestions and feel that we should have added some other relevant product to this article, do let us know in the comment section below. Last but not least, thanks for visiting our site and if you like our articles, please do consider subscribing to our weekly newsletter.